Given that the aims of an election system (how votes are translated into seats), include a range of opinions and political views being represented in a Parliament, votes being of equal value, and voters feeling that they have a proper choice of parties to select from, it is easy to see why First Past the Post (FPTP – the election system used to elect Westminster MPs works particularly badly in Northern Ireland. Thankfully, it is isn’t the only election system used in Northern Ireland, because Single Transferable Vote (STV) is used for elections to the Northern Ireland Assembly at Stormont. The reason STV was chosen was to ensure the greatest chance of fair representation in Northern Ireland’s political system, as well as to reduce wasted votes. 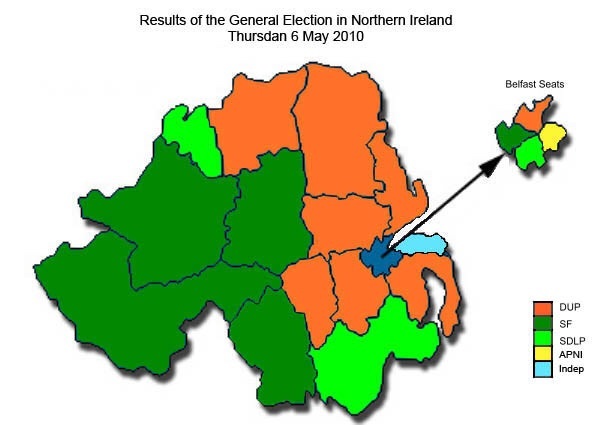 It was a good choice, because a look at Northern Ireland’s Westminster constituencies shows how FPTP reduces representation and wastes a lot of votes. Northern Ireland is unique amongst countries in the United Kingdom because there is less of a ‘political spectrum’ electoral cleavage (gaps between voters, which in England tends to be ‘left to right wing’ on policies. Instead, the electoral cleavage is between those who are supportive of remaining constitutionally within the United Kingdom (‘Unionists’), and those who identify instead with the rest of Ireland (‘Nationalists’ or ‘Republicans’). On each wing of this cleavage are two parties. On the Unionist side are the Ulster Unionist Party (UUP) and the more extreme Democratic Unionist Party (DUP) whilst on the Nationalist side are the moderate SDLP and the more extreme Sinn Fein, who used to be the political wing of the IRA before that got disbanded. In the past few elections, the more extreme parties have gained the upper hand, with the DUP gaining 8 seats in 2010, Sinn Fein 5 seats, the SDLP 3 seats, and one seat going to the ‘neutral’ Alliance Party, and one seat going to an independent. The UUP have no seats at the moment, which tells its own story. The problem is that in many constituencies in Northern Ireland, parties on each side of the political divide can only win if the other party on ‘their side’ doesn’t seriously stand. The way First Past the Post works, being a ‘plurality’ system (you just need one more vote than any other party), if the SDLP and Sinn Fein campaign the the best of their ability in a constituency, then it is quite possible neither will win, as the Nationalist vote will be split and the DUP, say, could win with only about 35% of the vote. The converse could happen, and did happen in Belfast South, where the DUP and UUP both got 20%, but the SDLP candidate won with 40% in a constituency where Sinn Fein didn’t run. So, for your ‘side’ to win, you may not be able to vote for the party you actually support, but the party with policies that are nearest. Any election system which relies on parties holding back on campaigning so a party with a similar ideology might win is not an election system offering a proper choice. Under STV, the DUP would have been allocated the second choice votes of the UUP voters, and that could have made a difference. Also, in those many constituencies where one party wins, by a distance (usually where the other party on their side hasn’t campaigned), under STV their ‘surplus votes’ are redistributed to the second choices of those who voted for them, so every vote counts. But the Westminster election system is FPTP, which is why we are able to predict even now that the seats will probably be retained by the parties who currently have them, and that the Northern Irish people will continue to be short changed by a system that doesn’t represent their views properly.